At last, here’s a step-by-step guide to choosing and combining colors for graphic designers, artists, hobbyists, fashion designers, interior decorators, and everyone else who works with color. • Dozens of full-color photographs that show you how your color schemes will look in the real world. • An introduction to color theory. • A palette of 61 basic colors, including the hot new shades of pink and blue. 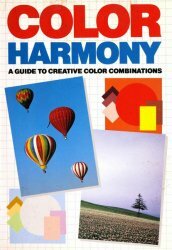 • A complete color guide to all the basic colors, including warm colors, cool colors, vivid colors, and more. • Color schemes to suit any mood: striking, tranquil, exciting, natural, and many others. • 1,662 individual color combinations, arranged according to hue, shade, and purpose. • Practical applications for color in art, industry, and daily life. • 12 helpful guidelines for choosing your own color schemes. • A four-color conversion chart for graphic designers. Special bonus! 61 full-size color cards that you can cut out and use to match colors.